The storey begins a long time ago from when I was still living in the UK and I had three ID19 Safari's with the station-wagon body and the love of the cars was in the blood. Long trips all over Europe with a right hand drive Citroen was a total joy eating the miles on the worst roads in total comfort, even driving it down the side of a mountain because being young and maybe a bit dumb you could and the car just took it in it's stride. Driving it through France and being a right hand drive used to bring the people over to look at it as if it had just arrived from Mars and it was all a part of the wonder of the car. On one trip to Spain we stopped at a friend’s place and he was renovating the path around his house and needed to pick up some sand from the local builders yard. So we cut the top off a 44Gallon drum and put it in the back of the Safari with the open end pointing towards the back closed the back door and went to the builders yard where we filled the drum with sand (still inside the car) as it filled the back of the car finally was touching the ground and the front was at full stretch way up on its top stops. The workers at the yard stopped work to watch these crazy English people with their car touching the ground, so we carried in merrily filling up the drum and once it was full we went and paid in the office and jumped in the car, started the engine and good as gold the hydraulics pressured up and the car got off the ground, leveled it’s self off and away we went leaving the astonished works at the yard with their jaws dropping to the ground. Many many years have gone by since those mad cap days and finally a new Citroen has been acquired and this is it’s story and how it came to me. 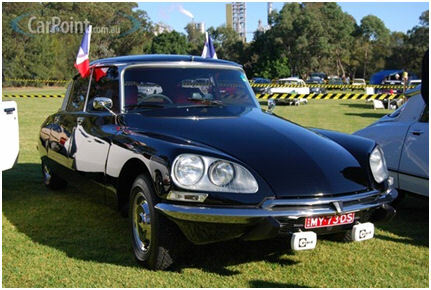 I run an online technology store at www.techbuy.com.au and the courier driver that picks up from us up each day happened to mention he was buying a DS23 and we got talking about the Citroen DS and my Safari’s. one which is one of the best examples to be found, just the best restoration you could ever find an amazing job by its owner and worth every cent of what he is asking for it. It is a winner of 8 trophies at the French car shows but sadly it is out of reach of my pocket. If you want to see if it’s still available check out here. Sitting at the computer one evening I said to my wife Michelle, “there are just none around” (that were in my price range or condition) this was like red rag to a bull, my dear wife just had to show me there were cars out there, being “The man” I said I have been to all the car sales sites, eBay car sales and Google searches there is just nothing! Within about 15 minutes she had gone to www.drive.com.au (where I had never been or found) and there was a DS23 Pallas Automatic for sale in Melbourne and it looked really good in its pictures. I went off to work the next day and later in the morning Michelle called and asked if I had phoned the owner yet, I said no as I did not have his number, within a couple of minutes she had jumped on the Internet found the car and gave me the number so I called and spoke to the owner. It all sounded good as the first question was “How much rust in it?” and was told none! WOW! Excitement was building, further questioning and he said call the garage who services it they will tell me more, so I called and spoke to the head mechanic and told him I planned to drive it back to Sydney (about 900Km) and he assured me it would do it easily and it was one of the best around having been regularly serviced and maintained by its current owner. A trip to Melbourne was arranged with me dragging my Sales Manager James to come with me to share the drive back and off we went flying down one morning to see the car. When we arrived it was garaged and started on the first turn and sounded a little tappety but expected in a car of this age, I crawled under it, in it, around it, mats up looking for rust in the sills, then looking under the chassis, in the boot under the doors just everywhere they are known to rust and only found one tiny little bit where it did not matter. We then drove the car around Melbourne for about 20 minutes and it was sweet all the way. The only setback was the spare tyre was totally dead, but decided to risk going back without one. We then went in for a coffee and after some backwards and forwards negotiations a price was agreed and I had a DS23. As I write this the car is now in my warehouse in Sydney and getting ready for its new number plates which require a Blue slip (road worthiness certificate) and then down to the RTA for the new plates which will be DS 23 PA for the DS23 Pallas. 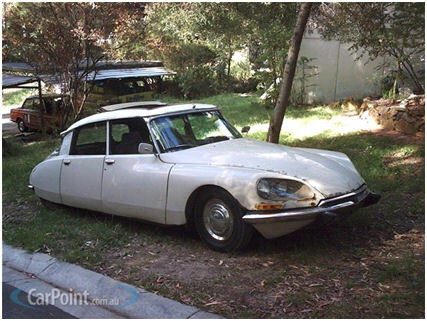 I have found a spare DS23 (automatic type has a different crankshaft to the manual) engine for $3,500 and am getting it checked out, I will then use this engine in the car while the original engine is stripped and then rebuilt so it will maintain originality.